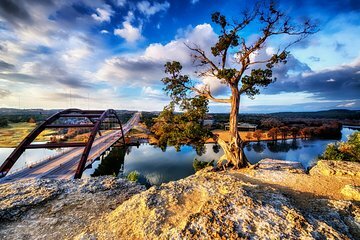 Découvrez Texas Hill Country tout en explorant la vie de Lyndon Johnson, fils du président des États-Unis et natif du Texas. Après une prise en charge à l'hôtel, rendez-vous à la «Texas White House» de Johnson, sa maison d'enfance reconstruite (aujourd'hui un parc national), ainsi qu'au parc national et site historique Lyndon B. Johnson. Découvrez les cow-boys et les immigrants allemands qui ont façonné la région, arrêtez-vous dans la ville historique de Fredericksburg et visitez la légendaire ville de Luckenbach, qui accueille de la musique country. We had some problems on this tour, the first bus had a/c issues so we had to change it, then on the way to Texas White House the replacement vehicle developed a flat! Our driver managed to get us on another bus to take us to the lunch stop while repairs were made! The travels through hill country were interesting, the guide kept us well informed, mainly by audio tape, of sights and areas we passed through. LBJ’s house and farm were an interesting stop, though at time of our visit it was not possible to get inside due to repairs. The information on LBJ shone a slightly new light on his presidency, I was unaware of how much legislation he had passed, of course the Vietnam war remains his defining legacy! Lunch in Fredericksburg was fine and we spent a little time looking around whilst awaiting our vehicle. The trip back to SAN Antonio was pleasant as was the stop at Lynchburg, an odd but interesting venue for some famous musicians! We had a wonderful time on our tour of Austin, LBJ, Fredricksburg and the Hill Country. Our tour guide, Eve was fantastic. We got to see and learn so much. Highly recommend!